You can add Bill Hader and Kristen Wiig to the ever-growing list of former Saturday Night Live cast members who have successfully made the successful leap into dramatic territory – though the likes of Bill Murray, Dan Aykroyd and Will Forte have picked more nuanced projects like Lost in Translation, Driving Miss Daisy and Nebraska respectively, The Skeleton Twins offers the best of Hader and Wiig’s firmly-established on-screen personas while also hinting at something much deeper and unexpected in their acting abilities. Despite steady direction by Craig Johnson (True Adolescents) and a poignant script co-written by him and Mark Heyman (Black Swan), from very early onwards the film does not want to assert itself as an upbeat, chipper family comedy – after all, one of the first scenes is of Hader’s struggling gay actor Milo slitting his wrists in a full bathtub in a failed suicide attempt, which doesn’t exactly open up a world of comedic possibilities (except in a Happy Madison production, in which case they’d probably scrape the bottom of the barrel, the jerks). In fact, those expecting a full-blown comedy based purely on Wiig and Hader’s past association with the genre is sure to be taken aback by how dark the tone that the film sets itself is. The idea of suicide hangs over the film constantly (no pun intended), whether it’s in passing reference to Milo or Wiig’s Maggie’s attempts as seen at the start of the film or in the revelation that it runs in the family (their father is said to have jumped off a bridge when they were teenagers). Add to that the acts of adultery and paedophilia (for the former, the married Maggie is shown to have had various sexual liaisons with other men including one with Boyd Holbrook’s scuba diving instructor; for the latter, Ty Burrell is a former lover of Milo’s who romanced him when he was fourteen), and you have one hell of a downer of a sort-of comedy with a more dramatic edge. The reason it’s all so engaging and watchable is, as you may have already sussed, that the two lead performances are so strong and poignant, offering career-best turns from both as a result. Hader, having been a major supporting player in various comedies as well as dramas (he’s due to appear on-screen soon in The Disappearance of Eleanor Rigby, opposite James McAvoy and Jessica Chastain), finally gets his chance to truly shine here in a role some may see initially as a simple caricature based around his homosexuality but may end up surprising many with how deep and heartfelt his cynicism and ironic passion for life can come across. Juggling perhaps the more difficult and least likable role of the pair, Wiig helps create a character whose flaws more than outweigh her qualities yet there’s something deeply tragic about her flaky persona that it’s difficult not to at least partially sympathise with her, despite some of her more reprehensible decisions throughout the film. Her reluctance to have a child with husband Lance (Luke Wilson), who despite being a fairly decent bloke is Maggie’s polar opposite in every sense of the phrase, is one of the many things being built on top of her numerous infidelities, and Wiig manages to mix them together to create a character that’s as pathetic as it is monstrous. Both share a very strong chemistry with each other, and it’s in these scenes where the film truly shines. Whether it’s messing around in a dentist’s office inhaling laughing gas or – in a standout sequence – lip-synching the words to Starship’s “Nothing’s Gonna Stop Us Now”, it’s clear that they are having a ball just being in each other’s company, and for us it’s as if the days of SNL are still fresh within them. Not that they ever ceased being funny and talented when they both separately left the show, but if you go and watch the countless sketches they performed in together (the SNL YouTube page is your best place to start) they just work off each other so well, almost like the great comic duo that never branched out. It’s the same situation here, only with the comedy much more dialled back and something more heartfelt taken over. There are a few niggles here and there, though these mostly have to do with the slightly conventional story which eventually builds to a predictable climax. 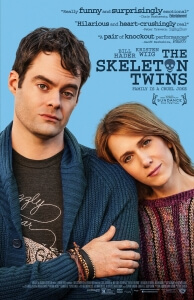 But the strength of Hader and Wiig’s on-screen personas bouncing off one another like flies that are high on Red Bull is the true attraction of The Skeleton Twins – even if you find its subject matter a little unnerving, and at no point does it want to make us laugh at any of it, you’ll still find yourself engaged in two very strong performances from beginning to end. Send in the clowns? They never left. The Skeleton Twins successfully mines tasteful elements of dark tragi-comedy from strictly taboo subject matters such as suicide, but it’s the two lead performances by Bill Hader and Kristen Wiig, as well as their strong chemistry, that ultimately wins the day.